Maybe the fourth time would be the charm for salutatorian Brooks Hamby. He had submitted his graduation speech to school officials three times, each draft mentioning his faith in Christ. Every time, the draft was rejected with all references to his faith redacted. Brooks, bound for Stanford University in the fall, emailed his fourth draft to the Brawley Union School District superintendent, his guidance counselor and his principal hours before graduation, but he never heard back. When he took his place at the microphone, Brooks spoke from the heart in defiance of the ban on Christian references. 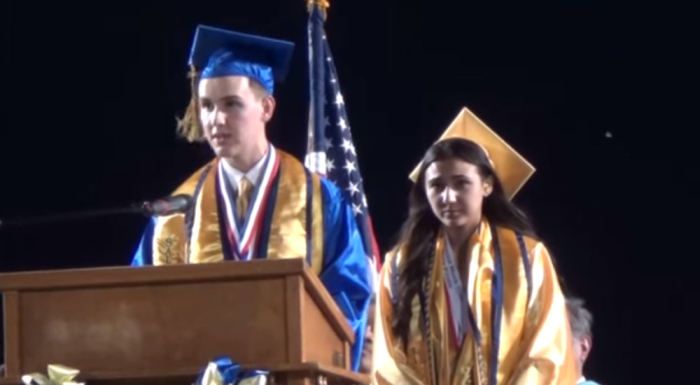 Despite a warning from the school district, the sound was not cut off, and he completed his speech with a blessing from "the God of the Bible." While officials likely fumed, the crowd cheered in approval.